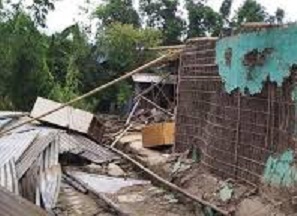 An irate mob gutted the house of a man suspected to be involved in the murder of a woman in Imphal East district (Manipur) on Tuesday. While the accused, who was arrested on Monday, is under police custody, his family members have been “ostracised” from the locality by the locals. A report published in the The Indian Express stated that according to police, the accused named Rohit, 29, from Khergao Makha Leikai, was arrested on Monday evening by a combined team of Imphal East and Kangpokpi police. The victim has been identified as Pukhrihongbam Memi Chanu, 26, of Ekou Bazaar. Memi and the accused had known each other through Facebook for only a month. He used a fake account in the name of one Romesh Singh and “befriended” her. The report further stated that on August 14 last, Memi left home around 1 pm to meet Rohit and went “missing” after that. The same day, a case was filed by the victim’s father that his daughter was kidnapped by a man name Romesh Singh. In the police investigation, it was revealed that it was his fake name. The girl’s body was fished out of Iril River inside a gunny bag on August 17 last. According to the police, the accused has confessed that he murdered the girl due some argument over their elopement. However, further investigation is under way to ascertain the circumstances that led to the murder of the girl, the police added. Meanwhile, a public meeting convened at Ekhou Bazaar, the victim’s locality, has demanded that the Government “hang” the accused within 48 hours. The public meeting also resolved that the last rite of the victim will not be performed until the demand is fulfilled. The lifeless remains of the victim are still lying at the mortuary of Jawaharlal Nehru Institute of Medical Sciences (JNIMS) hospital here.